The Best Immersion in “Reality”! The CGV Film Industry Media Forum 2016 was held at CGV Yeongdeungpo on January 28. CGV has always been involved with the development of new theater types such IMAX, Sphere X and Screen X, and at this year's forum, they did not disappoint. At the forum, CGV presented the Global Cinema Technology Trends, which offered a new direction for futuristic theaters. It was exciting to listen to CGV’s keen process of developing technologies that convert the mundane-level act of watching movies into an “immersive” experience. CJ Creative Journal covers the vision of futuristic theaters introduced by this presentation, which was delivered by Park No-chan, head of CGV’s cinema projection technology team. When the Lumière brothers screened Arrival of a Train at a Station, the world’s first moving picture, in Paris, France in 1895, audience members were gripped by panic when they saw a train rush headlong towards the camera and – as they thought at the time – onto them. Since Arrival of a Train at a Station, the value that movies seek to deliver to audiences has remained unchanged. This is all about enabling the audience to be more immersed in the images; about pulling the audience into stories that unfold in a spectacular setting or vast outer space inaccessible to everyone but for our imaginations! This has always been the film industry's unchanging goal – even now, 120 years after the birth of film. Film screening technology has constantly evolved. Silent films have evolved into sound films; analog projectors into digital cinemas; CinemaScope into IMAX; general films into 3D, and further into virtual reality (VR). Recently, there has been an epoch-making event amid the continued evolution of theaters – the advent of the digital cinema era. What has to be done for theaters to survive in the digital cinema era? 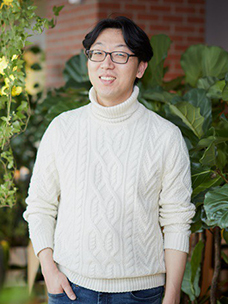 ▲ Park No-chan, head of CGV’s cinema projection technology team, explains CGV’s vision for "futuristic theaters"
The generalization of digital cinemas has enabled screened films to show a consistent definition and quality from the beginning to the end. The wavering, afterimage, and sound static which appeared on old films now belongs to a bygone age. The process of using two projectors, one for screening the film and the other for rewinding the film, has disappeared. The time for screening preparation and the number of management personnel have also decreased. Events like a “simultaneous world release” can easily be held today because of the way film content can be saved to a file. Digital cinemas have also changed the meaning of theaters as a place. Several platforms such as IPTV and mobile devices have emerged for people to enjoy movies outside of theaters. As films are digitalized, people can open files anytime, anywhere. To respond to the reduction in the significance of theaters, CGV is trying to break through this crisis by providing differentiated experiences. Its answer to this is the combination and evolution of “screen”, “sound”, and “seat”, the main components of all theaters. 3S (Screen, Sound, and Seat) experienced only at theaters! ▶ Large-size theater: Super-sized screens provide a more realistic image and a greater immersion. IMAX and Starium are the leading large-size theaters. ▶ Special theater: Special theaters feature DTS-X and other audio systems providing grand and realistic sounds together with motion-enabled seats inside the 4DX theater. 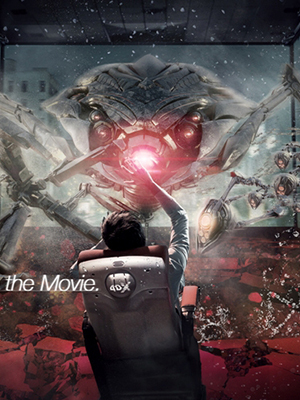 4DX and Sound X are the leading examples of this immersive experience. Immersion is where the future’s at! Here’s the theater of the future. A viable futuristic model for theaters can be found in the “immersion” concept. Futuristic theaters offer the highest level of audience immersion by using a total solution combining all the components of theaters, including screen, sound, and design. Taking the lead in the future of theaters, CGV offers theaters with a new concept targeting not just Korea, but the whole world. The representative examples are Sphere X, a dome-like theater system installed last year in Korea, Indonesia, and China; and Screen X, which projects footage onto a theater’s side walls, as well as its main front screen. Sphere X has a dome screen which presents the audience with the highest level of spatial immersion. The audience can feel the three-dimensional effects, as if the characters in the film are popping out of the screen. Sphere X features a screen that curves both vertically and horizontally, 3D sound that feels like it is falling from the sky thanks to the ceiling speakers, as well as reclining chairs to provide an optimal field of view by installing each seat at different heights and angles. These all provide the audience with a feeling of a shortened distance between the screen and them ensuring that they are truly surrounded by the movie. The Sphere X theater at CGV Yeongdeungpo features a laser projector 9P 4K, unveiled for the first time in the world. The projector was designed for optimal use with the Sphere X system by the US digital cinema projector maker Christie. 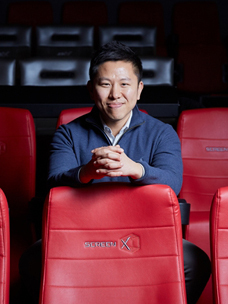 Screen X, a technology co-developed by CGV and the Korea Advanced Institute of Science and Technology (KAIST), is a three-screen system that offers a 270-degree view from a three-dimensional angle by utilizing the front screen, as well as the side walls of a theater. Screen X has the capability to provide the audience with an immersive experience that makes them feel like they are in a film using a three-side screen. Unlike existing 3D films, Screen X creates an immersive experience without the need for special glasses and thus does not cause discomfort or dizziness. An even higher level of immersion is made possible through a wide field of view using the front and side walls, as well as three dimensional image effects. Additionally, constructing images in a panoramic style can create a unique image of beauty. Recently, The Himalayas was screened in Screen X theaters, presenting the audience with the beautiful scenery of the Himalayas covered in snow. CGV has developed all of its special theaters, including Sphere X, Screen X, and 4DX with domestic technologies. CGV’s cinema projection technologies are a colorful part of K-Culture, which is now spreading around the world. CGV is planning to present the audience with the best and most immersive cinema experience by appealing to the five senses, through immersion in the images by developing a futuristic multiplex special theater that combines the five-sensory theater 4DX, special seats and motion effects in Screen X, and the 3D sound system of Sound X.
CGV’s cinema projection technology is leading global cinema trends by creating a variety of experiences that can be enjoyed only in theaters. Enjoy the time when a movie-going experience becomes not just watching a film, but an immersive experience. Have an exciting time at CGV! ‘ScreenX’ is a new innovation and driving force for the movie industry!